In a broad sense, each of these firms faced a similar complex challenge—they were missing opportunities to deepen customer relationships (and increase revenue) because business units within their firms were not collaborating sufficiently to develop more comprehensive “total solutions” for customers. To address this issue and develop executive talent, each firm committed to a series of Action Learning Projects—staffed by high potential executives from across business units and functions—designed to diagnose the problem and recommend new business process, managerial practices, and organization structures. Many corporate level and business unit strategies assume that the firm has the organizational and behavioral competencies needed to actually implement the strategy, but often that is not the case. What organizational competenices are needed to be competitive in the future? How do firms build these competencies? How do firms overcome barriers to execution? It is work on real business issues—not historical cases and classroom lectures. It brings people who do not often work together—initially as a group, progressively as a team—to blend skills, and put them in different roles. It emphasizes field-based research to find answers for issues that are important and urgent to the firm. It allows teams to propose solutions and argue for resources to create opportunities or solve problems. 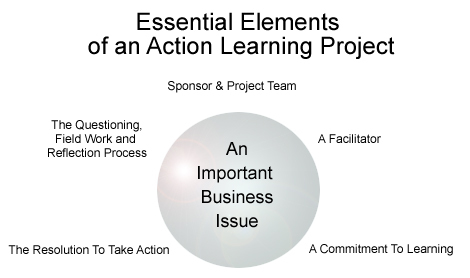 It is the emphasis on learning—for individuals and for teams—that makes action learning efforts more than just business projects. It is becoming a widely-used approach to developing management talent in multi-national firms such as GE, Motorola, Siemens, Aventis, Textron, AXA, IBM, Citigroup, Fujitsu—and it has become a big element in executive education efforts at Wharton and other leading business schools. 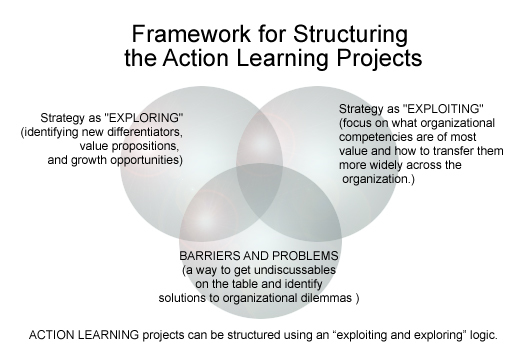 Action Learning serves as A SCHOOL FOR LEADERS. • Team building exercises since participants come from different units etc. • Experts, best practice companies, existing data, etc.